This week, we ran a workshop on how to run a discovery (the first, early research and development stage) for any project, not just digital ones. About 60 people came from across government and other organisations. This post is about what we did, the outputs and what's next. The Department for Education (DfE) has a lot of large-scale and complex projects to deliver. Quite a few of our major projects are in the early stages of development. 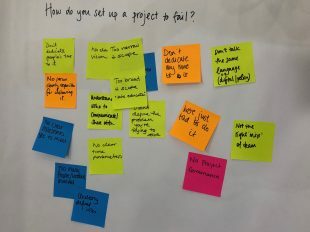 This is the most important stage in any project's life cycle - many projects that fail do so because of errors and omissions in the early discovery phase (see, for example, the NAO's guide on initiating successful projects). To help us make sure our major projects are set up for success, we've decided that all DfE projects will go through an initial discovery phase. Projects will have to complete this phase before we decide whether and how to take the them into the development and delivery phases. 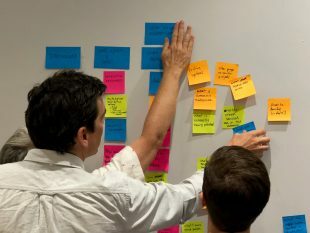 Discovery is a standard phase in government projects to develop digital services (see the Government's Digital Service Standard) and there is quite a lot of guidance about how to do it (such as Will Myddleton's excellent blogpost on the topic). The idea of discovery is less commonly applied to other projects (although you could argue that a lot of early policy development work comes into this category, or should do). There is not much guidance around about how to do that. So we decided to produce some. We're working in the open so that we can learn from others in the government project delivery community and so that we can share what we learn for others to use. We will check back in on our understand of what our teams need, in the light of what we learn as we test and iterate the guidance. The output is this document containing a long list of headings and sub-headings. We will eventually turn this into guidance (probably not in long document format, bearing in mind the need for easy accessibility and usage). We said we'd publish the document and ask everyone to drop in any links, references, tools or practices that they know of that might be useful for people to refer to or use - if you're interested and have links to share, please add them as comments / suggestions. (People not used to using Google docs: we're using this because it means anyone with the link can add comments - you don't need a Google account, you can add comments and suggestions anonymously. We're also happy to receive suggestions in whatever format works for you - email is fine, as is Twitter, ideally using the #govdisco hashtag so we can easily see everyone's responses). I'm about to disappear on holiday for a week or so - when I get back, we'll start pulling together some draft guidance based on our own research, this workshop, and your contributions to the document. We'll share the results of that work here in September. Thank you so much to everyone who came along to the workshop - I hope you enjoyed it as much as I did, and that you'll find the outputs useful too.